Virtue Sweetener brings you the best of both worlds and is FOUR TIMES the sweetness of sugar. So you get just the right balance of the baking properties and bulk of erythritol with the wonderful sweetness of Monk Fruit Extract (luo han guo). Many other combination sweeteners have a 1:1 ratio to sugar sweeteness, but that means having to use either a lot of erythritol, accompanied by its cooling taste or gastro issues, or too much stevia and its funky aftertaste. 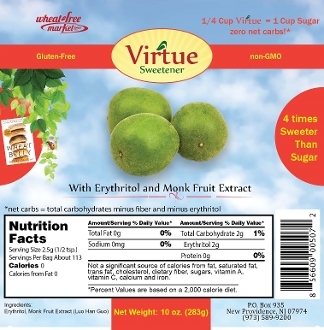 Monk Fruit extract has no aftertaste so it can be used in sufficient quantity to reduce the amount of erythritol used. And at four times the sweetness of sugar, merely divide by four for conversion. No need to look up conversion charts on the internet! Unlike many other combination sweeteners, which merely mix ingredients together only for them to sift apart in the container, this blend is re-granulated so you have an even distribution of the high-intensity sweetener with the erythritol. And don't let the price fool you. Given its 1:4 sugar conversion ratio, it is one of the most economical sweeteners of its type on the market, because you use so much less!